Online slot devotees spoiled for choice have yet another option to win big since one of the most exciting releases for this month is Pragmatic Play's new 243 ways to win Caishens Gold slot. Pragmatic takes play to a grippingly unprecedented level by combining an array of marvellous bonus features including four jackpots with an attention-grabbing colour vibrant Chinese theme. The New Caishens Gold slot features Cai Shen as the wild, substituting for other symbols, apart from the Hong scatter, to boost chances of forming additional combinations. The wild symbol does not offer payouts on its own and appears exclusively on the second, third, fourth and fifth reels. Cai Shen is also able to activate the bonus round, providing players with the opportunity to win one of four fixed jackpots. Three, four or five Hong scatters appearing on adjacent reels from the leftmost reel initiate the free spins bonus, triggering ten free spins while high card symbols imaged as musical instruments are removed during the bonus round, and the remaining symbols appear in vertical stacks. Scatter symbols appear freely across all reels and provide winning worth up to 1,900 coins when five are visible at the same time. The bonus round takes play-action to a screen displaying twelve coins, players need to select coins, while the goal is to reveal three identical jackpot symbols in order to trigger major, mini, grand or minor jackpot. Packed with a fusion of mystery and excitement the jackpot round offers winnings worth up to 30 times the total bet via the mini jackpot, the minor jackpot offers 50 times the triggering bet, the major up to 100 times and the grand jackpot offers 1,000 times the total bet. When it comes to games looking to the Far East for inspiration players can enjoy an array of slots based on Ancient China mythology and religion at La Fiesta Casino. Caishens Gold slot is a perfect option for slot enthusiasts searching for the best return to player percentage since it promises an RTP of 97.08%, while lower valued symbols are omitted from all reels during free spins, increasing significant payout possibilities. New players to the casino can take advantage of a $15 no deposit bonus, plus when making your first deposit, a 400% match bonus up to $1000 awaits. Why delay? Register today and start winning for free with a Pragmatic Play no deposit bonus. By Cai Shen accepting to function as the wild, apart from standing in for others he grants ten free spins while an array of combination winnings can be achieved across 243 ways to win. 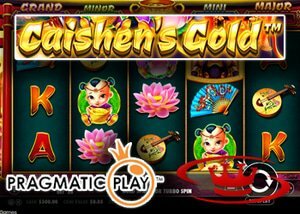 In Caishens Gold it is the four jackpots arranged on both sides of the golden pot that is bound to send players hunting for treasures at all online casinos partnered with Pragmatic Play.